We’d love your help. 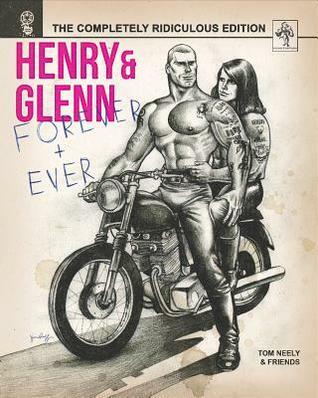 Let us know what’s wrong with this preview of Henry & Glenn Forever & Ever by Tom Neely. The greatest love story ever told has finally been released in graphic novel form, featuring 20 short stories about the domestic life of "Henry" and "Glenn" and sometimes their neighbors "Daryl" and "John." Glenn deals with issues with his mother while Henry, "a loud guy with a good work ethic," shows his darker side and indifference to a fan Two men. Two myths. One legend. To ask other readers questions about Henry & Glenn Forever & Ever, please sign up. Spinning off from a drunken riff on Tom of Finland, the real charm here is parodies of domestic comics, be it Nancy or Archie or romance comics generally. For no clear reason Hall & Oates live next door and are extremely evil wizards. The homoeroticism is low-key and the overall tone is small domestic disputes played for laughs. This is an anthology and lots of one-pages vary wildly in quality, but this is a fun read even if you are not acquainted with Henry or Glenn’s oeuvres. It is pretty much exactly what you would expect from this premise, but I really appreciate the amount of time, energy, and pettiness that went into what was essentially a drunk joke among friends.